Is Gus Grissom angry after the Liberty Bell 7 nearly took him to the bottom of the ocean? Weary? Thoroughly shaken? It's hard to know for sure. 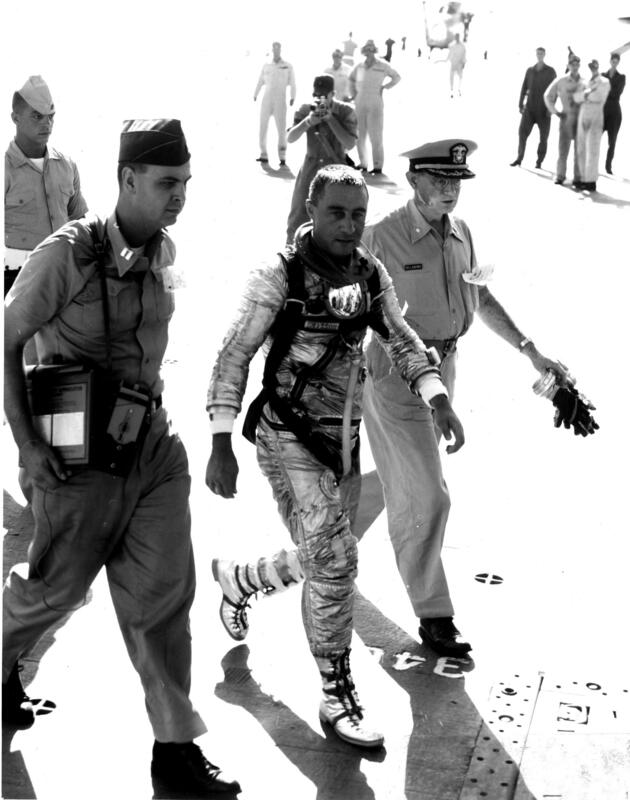 Gus Grissom had just entered the history books. A mere 10 weeks after Alan Shepard made America’s first human flight into space, Grissom followed with the second one, a 15-minute suborbital hop that took him to an altitude of 189km above the blue planet. After the small Mercury capsule’s parachutes deployed, Grissom splashed down in the Atlantic Ocean, seemingly bringing a flawless mission to a close. Only it wasn't flawless, nor was it closed. At that moment, Gus Grissom almost drowned. It was July 21, 1961, toward the end of the second Mercury mission, and the hatch to Grissom's spacecraft blew early. The ocean flooded in. The astronaut responded by jumping free of the Liberty Bell 7 capsule. He struggled for five minutes to remain above the churning waves even as his spacesuit, already 22 pounds when dry, filled with water. This incident has gone down in history amid controversy. Some renditions of it, including the famous The Right Stuff novel and movie from Tom Wolfe, portray Grissom as “screwing the pooch.” Such accounts argue that the astronaut panicked and fired his hatch before it was time, essentially inviting the water in. But a new book by author George Leopold about Grissom’s life—Calculated Risk: The Supersonic Life and Times of Gus Grissom—and a recent interview with the head of NASA’s recovery options for the Mercury program, Bob Thompson, dispels that fiction. From these measured accounts, Grissom emerges as a quick-thinking hero. He reacted decisively in an uncertain situation when otherwise this mission would have ended in death. Such an accident early in NASA's space program could have given President Kennedy pause over the country’s nascent Moon-landing ambitions at a time when the US lagged badly behind the Soviet Union. More than half a century later, Grissom’s name has faded from memory. Shepard has the honor of the first US spaceflight, John Glenn made the first orbital flight, and Neil Armstrong stepped on the Moon. Yet after an all-too-brief career that ended tragically in the 1967 Apollo 1 fire, Grissom deserves recognition not as an unlucky footnote but as a genuine hero. And for today’s astronauts, Grissom's near-death experience in the Atlantic Ocean has renewed importance, offering a sobering reminder of the sea's peril as NASA plans to return its Orion capsule from deep space again by way of the ocean. Virgil Ivan "Gus" Grissom was the second youngest of the Mercury Seven astronauts NASA announced to the world on April 9, 1959. They were all hotshot test pilots, determined to become the first human to fly in space. Among the group, Grissom distinguished himself by working hard (and partying hard). By early 1961 he, Shepard, and Glenn had emerged as the frontrunners for the coveted first flight. Ultimately all of the Americans lost out to Yuri Gagarin, but Shepard claimed the US honor. Grissom served as the back-up pilot. The second US mission to space went to Grissom, however. He would largely repeat the first Mercury flight with two key modifications—the Liberty Bell 7 capsule would have a trapezoid-shaped window, and a new explosive hatch would allow Grissom to exit the spacecraft on his own. To blow the hatch, Grissom had to remove a cap from the detonator, pull out a safety pin, and push down on a plunger. After landing in the water with a “mild jolt,” Grissom was ready to press ahead with the final stage of his mission. “I felt that I was in good condition at this point and started to prepare myself for egress,” he said. Before firing the hatch, Grissom was supposed to wait for a rescue helicopter to fly over, hook into the lifting loop on top of the capsule, and raise it out of the water. Once clear, he was to remove the cap from the detonator, pull the safety pin, and activate the firing mechanism. Then he could step onto the sill of the hatch, climb into a horse collar lowered from the helicopter, and be pulled to safety without ever getting wet. A US Navy helicopter attempts to pull the Liberty Bell spacecraft from the water. This gallery takes you inside the nearly fatal mission. Grissom dons a spacesuit in preparation for America's second human spaceflight. A view of Grissom suited up and ready to go. Grissom, suited up and ready to climb into the Liberty Bell 7 spacecraft, talks with backup astronaut John Glenn. The spacecraft was the first US human-rated vehicle with a window. Astronaut Gus Grissom climbs into the Liberty Bell 7 spacecraft before launch on the morning of July 21, 1961. This is the hatch he would make an emergency egress from. On Jul 21, 1961, Mercury-Redstone 4 launched from Cape Canaveral, carrying Astronaut Gus Grissom and making him the second American to venture into outer space. The Hunt Club 1 co-pilot, John Reinhard, observes the Liberty Bell 7 below. Once hooked, pilot Jim Lewis struggles to lift the capsule. After the capsule sank, Grissom is hoisted in a horse collar, facing backwards. Retrieved from the ocean floor three miles deep, the Liberty Bell 7 Project Mercury capsule is revealed to photographers and the media in Port Canaveral, Florida. After 38 years on the bottom of the ocean, Liberty Bell 7 had seen better days.